405 pages | 219 B/W Illus. "Agroecology may be an unfamiliar concept to some, since our culture often treats agriculture and ecology as completely separate subjects, with common agricultural practices bearing no resemblance to the natural patterns that ecologists study. However, if one is not familiar with all of the factors that can affect food production, it can be hard to recognize adaptive responses to those factors. Fortunately, this textbook provides an excellent broad introduction to the subject. The book is well-written and contains many helpful figures and tables. 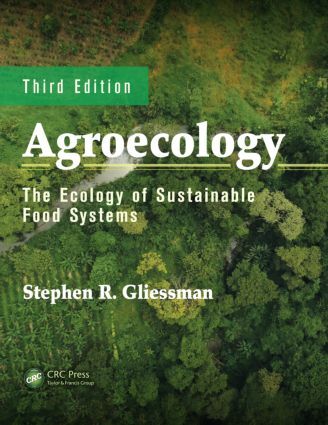 Since the book is quite affordable, for a large volume from CRC Press, it is also ideal for individual reading by any ethnobotanist who could use a refresher course on the basics of ecology or sustainable agriculture." "It is clear, insightful, well-illustrated and referenced, and the 21 chapters contain many useful case studies. It deserves to be in every library, and is a pleasure to read. This is a valuable manual, and vital for all concerned with learning and teaching in agricultural courses. It deserves to be widely used." "The author clearly is an authority in the field of agro-ecology and teaches on the subject. … Agronomists and biologists, as well as general scholars and people interested by sustainability as an attitude or life style wi11learn about how to put principles into (cropping and whole food chain) practice. All in all: a good read!"